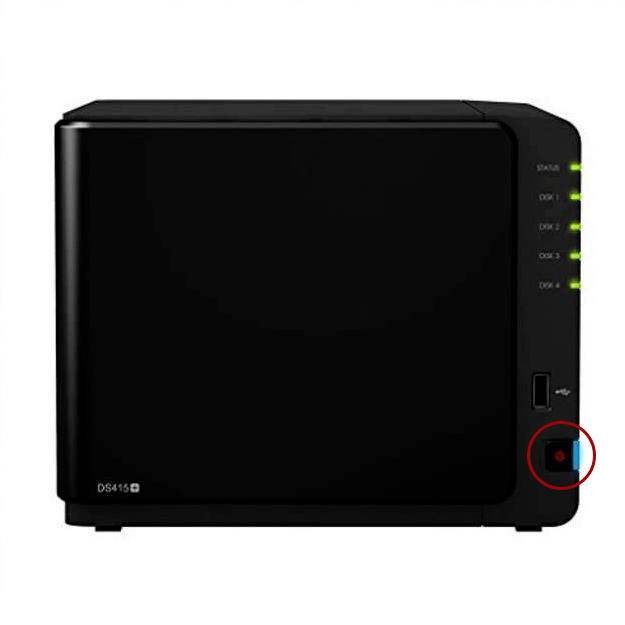 Can you switch off a Synology DS box from the Power Button? I asked myself this morning when I got a text from our building manager to remind me that the electricians would be in at my day job this morning and I couldn’t login via quickconnect. This is not an easy thing to find out (if you’ve not actually switched off your box physically before) and no-one wants their box to be inadvertently powered down. But it is possible. Power button circled in red. Press and hold until you hear the beep. Fortunately I have a box at home too and can practice. The key is to hold down the blue power button until it makes a loud sharp beep and then it’ll power down gracefully. And it worked. The fabulous Dawn was able to easily shut down the server. Crisis averted. Re-wiring of our lighting underway.